Here's my card for the current sketch at Freshly Made Sketches. This one came together quickly with the help of a few die cut paper scraps. 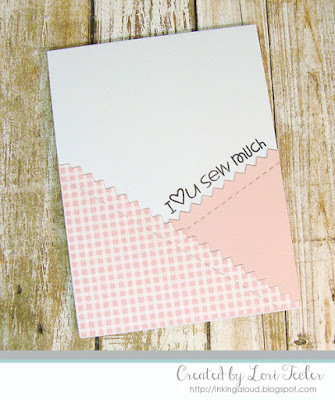 I used a pinking edge die to add a decorative edge to a pink gingham triangle and a pink cardstock panel. After cutting the decorative edge, I used one of the dies from the Paper Smooches Stitched die set to add a line of decorative stitching just beneath the edge I'd cut with the pinking edge die. The cut panels were adhered to the bottom corners of a white card base. After trimming the panels so they were even with the sides of the card base, I stamped the sentiment just above the top of the pink panel. The words are stacked on the stamp, but since the stamp is clear, it was pretty easy to stamp the words in a straight line instead. I thought about adding a button as an accent, but in the end, left the card unembellished so it would be easier to mail. What a great card Lori! I love the paper and the "pinked" edge! Such a great sentiment! Thanks for joining us this week at Freshly Made Sketches! 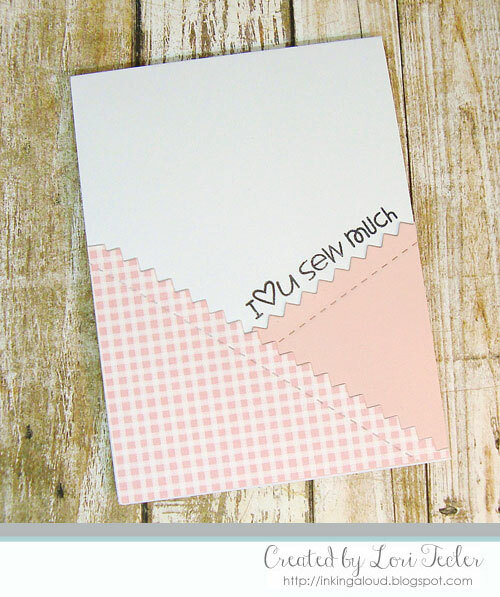 Love the pun in this card with the pinking edge and the sentiment! Fabulous card! Thanks so much for joining us at Freshly Made Sketches.